The product placement blog for jewelry and accessory designers. Get the Twitter Badge widget and many other great free widgets at Widgetbox! 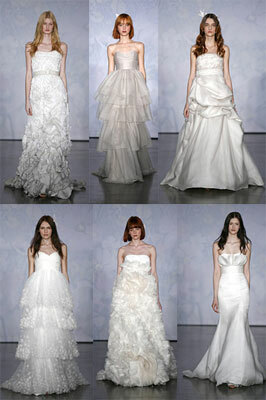 Did you know that last week was Bridal Fashion week in New York? Why you should know: Thinking it has nothing to do with you is the outlook of yesteryear, because the future of tomorrow holds more in store for you than you may realize. First, many of the designers on the roster at last week’s bridal runway extravaganza do not have bridal jewelry lines, and they often team up with a bridal jewelry designer to bejewel models for the catwalk and for photo shoots. Second, this year the toughest critics (often the best critics) took note of the fashion forward thinking incorporated into the lines of almost all the designers. If bridal trends continue to move forward in concept and design, which we believe they will, then won’t the jewelry move forward as well? And the accessories? And the bridesmaid’s accessories? With bright colors the trend de jour these days, and collections of gowns that are all inspired from the rest of the ROY G BIV color spectrum, the looks seen on the runway call for jewelry that is more colorful, more playful, and more eccentric. The days of all white gowns with classic platinum/pearl/diamond jewelry will stand the test of time, but outside-the-box accoutrements will certainly join the mix more and more every year. Why you will know next year: You can check out all of the shows at NY Mag online, but to give you an example of where YOU will fit in to the equation in the next year, I would like to focus on two of my favorite wedding dress designers. First up, the line by Monique Lhuiller (see photos above), who is no stranger to adding color to wedding gowns, was full of trims and draping that had an air of exquisiteness that can only be found in something vintage/something unique/something authentic. Her aesthetic is a throw back to a time of decadence and aristocracy, and the jewelry should match. Intricate or vintage-like pieces and non-traditional metals like rose gold, green gold, or oxidized gold would compliment beautifully. 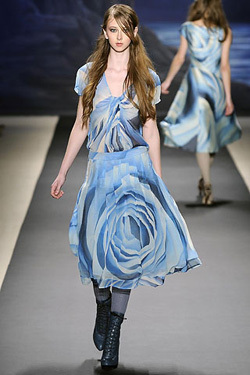 Next on my list is Reem Acra, who sent a fresh line down the runway, which was inspired by such outrageous characters as Alice in Wonderland and Raggedy Ann (see photos below). This fantasy like collection requires jewelry which is as mystical as the designs themselves. Bright and big cocktail rings, colored diamonds and gemstone, and big statement pieces, would bring out the underlying personality of Acra’s line. Furthermore, Aja Magnum (NY Mag) reported that the biggest trend for bridesmaid’s dresses is black gowns that are multi-purposeful. Too bad nothing matches black…oh wait…everything matches black. The possibilities of jewelry for bridesmaids are endless. It comes down to the ultimate question: Do you take thee (non traditional bridal jewelry) to be thy (non traditional bridal gowns) mate? I do! Photos from NY magazine online and Fashion Wire Daily. The Bold, the Bad, and the Beautiful! This weekend was fashion packed! With fashion week saving the best for last, and the Grammy’s causing the glitterati to flock down the red carpet, we got a good preview of the jewelry and accessory trends looming on the horizon. 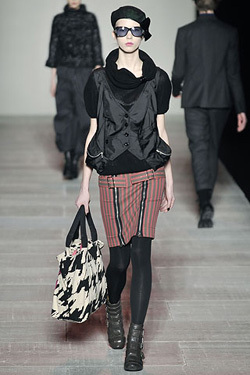 BOLD - Mercedes Bends Fashion Week ended in climactic success with the shows of two of our favorite boys Marc and Ralph. Marc Jacobs proved to us the same thing the Grammy’s confirmed later in the weekend – that big “notice me cuffs” are not going anywhere soon, while Ralph Lauren’s runway caused the audience to roar at the sight of tasteful leopard accessories. BAD - After an exciting Fashion Friday – the thought of a Project Runway winner chosen after their tent show was enough to get our hearts beating - we kicked back to enjoy a lazy Saturday. Since we never like to completely turn our brains off (we are seriously addicted!) we decided to do a little research for you, and so we share this very interesting article on the rising prices of gold. Brace yourselves - this is not a happy report. "GOLD PRICES now sit at all-time record highs..." Read more. BEAUTIFUL - Back to the good gossip we all know we love. Sunday proved to be another award show where we were more inclined to oooh and ahh than to hit the keyboard fashin’ bashing. Actresses were surprisingly well dressed for the most part – except Cher, God that woman makes some...uh, interesting choices, and we saw a lot of cuff and statement bracelets, as well as the gorgeous pair of earrings that singer Alicia Keys wore to open the show. Go to FabSugar to vote for your favorite Alicia Keys look last night. New York Fashion Week: Shoes, Bags, and Belts - Oh My! With Mercedes Bends New York Fashion Week winding down to a close, the blogosphere has been on overload with some wrap ups, trend reports, goo-eyed obsession wish lists, and otherwise just ranting, from some of favorite - and less then favorite – bloggers. Since our life’s dedication is to accessories and jewelry, shoes, handbags, belts, and jewelry will never escape our radar. So, while the clothes were oh so pretty, here is our final word on the accessories seen in the big white tent! 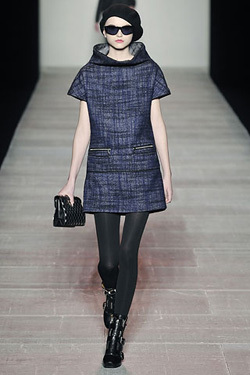 See their list of emerging trends! New York Fashion Week (Yay!) started off with a lot of heart on Friday. The first tent show that took place was The Heart Truth’s Red Dress Collection show. The idea: bring new meaning to the term Go Red by switching the sad feelings behind the AIDS awareness campaign to a more up-beat Red campaign. Oh, wait…they are now associating this Red campaign with raising awareness about heart disease in women. Swapping AIDS in exchange for heart disease doesn’t do much to lift the spirits, but since they managed a tie in to the elite NY Fashion Week, I’ll let it slide. Diet Coke teamed up with The National Heart, Lung, and Blood Institute to raise awareness of heart disease in women. But enough about that – we get it - do yoga, eat granola, etc. On to more important things…Any good cause brings out stars, and with the stars comes fashion. Renata Espinosa, Fashion Wire Daily, reported that stars including Heidi Klum, Molly Sims, Cheryl Hines, and Joss Stone wore such acclaimed designers as Michael Kors, Marc Jacobs, Donna Karen and Tracy Reese. A “Red-Heart” tent show featuring a cocktail of designers is the perfect way to start off a great week in fashion.